With only 28 days to travel this month, you'll want to finalise your travel plans sooner rather than later. Flight prices are fairly reasonable this month, with no school holidays or long weekends elevating flight prices. The cheapest flights can generally be found Monday- Thursday. Travellers on a tight budget should avoid weekend flights though, in particular Friday and Sunday flights. If you're planning a romantic break this month though, you can use our calendars below to plan for budget-friendly flights. Mango Johannesburg to Cape Town : Cheap flights are readily available on all dates this month, with the exception of the 2nd of February 2018. Mango Cape Town to Johannesburg : Surprise your loved ones with a visit this month as flights this affordable could be cheaper than red roses on Valentine's day! Mango Lanseria to Cape Town : Mid-week breaks are by far the most budget-friendly option, with Friday and Sunday flight prices slightly elevated. Mango Cape Town to Lanseria : Flight prices are incredibly consistent throughout the month with only a R60 difference between the cheapest and most expensive travel date. Mango Johannesburg to Durban : Avoid travelling on Fridays as they are incredibly expensive days to travel on this month. Mango Durban to Johannesburg : With affordable flights so readily available, you can pick and choose when you want to book. Mango Johannesburg to George : If you are travelling on a budget, you're better off looking at flights departing after the first week of the month and avoiding Fridays. Mango George to Johannesburg: Cheap flights are readily available and can easily be spotted in green below. Mango Cape Town to Durban : Avoid travelling on Sundays as it is the most expensive day of the week to travel. Mango Durban to Cape Town : Tuesday and Wednesday flights guarantee travellers the best airfares this month. Mango Cape Town to Bloemfontein : Where possible, don't travel on a Friday or a Sunday as flight prices are elevated over weekends, but the most expensive flight can be found on the 20th. Mango Bloemfontein to Cape Town : Avoid travelling on the dates highlighted in pink where possible. *Flight prices were gathered from FlyMango's website and does not include South Africa Travel Online's booking fees. These prices were updated on the 21st of January 2019. The longer since then, the better the chance that airfares and availability have changed. February is best known as the month of love, but it is also a short month with only 28 days to travel. With no school holidays, public holidays or long weekends in sight February is a fairly affordable month to travel. Choose a mid-week travel date for the best chance to find budget-friendly flights. Or look for dates highlighted in green below! Don't forget that the best gift this Valentine's Day is spending quality time together, whether you choose to take leave on the Wednesday or save the celebrations for the weekend. Mango Johannesburg to Cape Town : Travel on Mondays, Tuesdays, Wednesdays, Thursdays and Saturdays to get the cheapest flights. Mango Cape Town to Johannesburg :If you're hoping to do a weekend escape on a budget, you're in luck with some Friday and Sunday flights more affordable than previous months. Mango Johannesburg to Durban : Where possible you should avoid travelling on Fridays and Sundays as airfares are incredibly inflated. Mango Durban to Johannesburg : If you are looking to travel on a tight budget, try to avoid travelling on the 25th also known as payday. 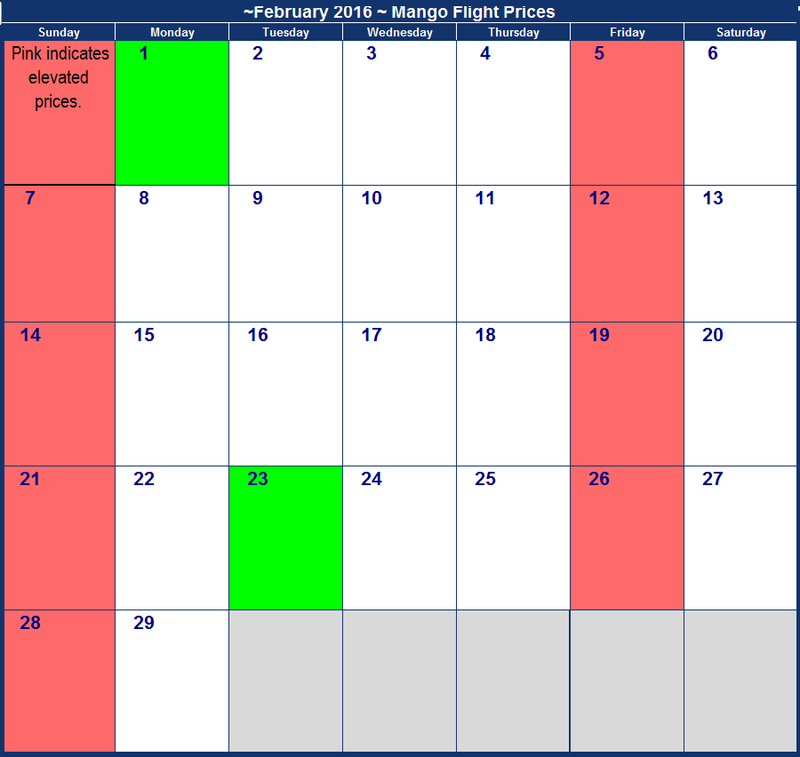 Mango Johannesburg to George : Look for dates highlighted in green to secure the cheapest flights available this month. Mango George to Johannesburg: Monday, Wednesday, Thursday and Saturday flights are by far the cheapest available. February might be best known as the month of love, but travel wise the lack of public holidays and long weekends also results in affordable domestic flights. Subsequently February is a great month to explore the country and possibly arrange a romantic break with your loved one. Those in long-distant relationships will also rejoice, with flights on the 13th and the 14th being incredibly affordable on most routes. Flight prices are pretty consistent throughout the month, with weekends being the most expensive days to travel on for most routes. Mango Johannesburg to Cape Town : Travel on the 20th and the 21st to get the cheapest flights. Mango Cape Town to Johannesburg : Avoid travelling on Sundays where possible as those are the most expensive days of the month. Mango Lanseria to Cape Town : Travel on the 13th, 14th, 20th, 21st, 22nd, 27th and the 28th to get the cheapest flights. Mango Cape Town to Lanseria : Where possible, travel in the beginning of the week as it will be more cost-effective. Weekend flights from the 2nd week is also more cost-effective. Mango Johannesburg to Durban : Most days are relatively affordable this month, but stick to dates highlighted in green for big savings. Prices are slightly elevated on Fridays. 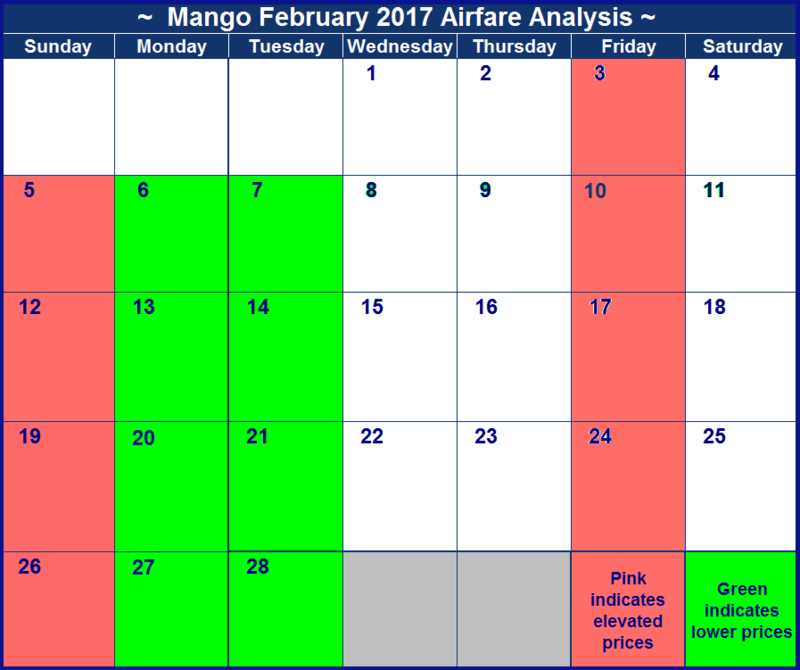 Mango Durban to Johannesburg : Most days are relatively affordable this month, but stick to dates highlighted in green for big savings. Flight prices are slightly elevated on Fridays and Sundays. Mango Johannesburg to George : Most days are relatively affordable this month, but stick to dates highlighted in green for big savings. Slightly elevated prices on the 3rd, 10th, 17th and the 24th. Mango George to Johannesburg :Most days are relatively affordable this month, but stick to dates highlighted in green for big savings. Slightly elevated prices on the 3rd, 5th, 12th, 17th, 19th, 24th and the 26th. Mango Durban to Cape Town : Avoid travelling on Sundays as those are the most expensive flights. Travel on the first 2 - 3 days of every week to get the cheapest flights. Mango Cape Town to Bloemfontein : Where possible, don't travel on a Friday or a Sunday as flight prices are elevated over weekends, but the most expensive flight can be found on the 21st. Flight prices were surveyed on the 19th of January 2017. The more time that has passed, the less likely these prices are still available. February is the month of love! With loads of long-distance couples (thanks Tinder) and V-day's convenient weekend time-slot, we expect heart-eyed travellers in big numbers. Where possible, try to avoid travelling on the 12th of February unless you want to compete with helium heart balloons and share a seat with a teddy bear. At least as there are no public holidays it leaves the rest of the month free for travellers! Weekends are still busy travel periods as we all love exploring the country when the weather is pleasant, so steer clear of those where possible. If you're still unsure of when to book your flight, consult our comprehensive flight survey below. Prices were surveyed on the 28th of January 2016. Mango Johannesburg to Cape Town : Flight prices are relatively consistent throughout the month, just avoid the 3rd, 5th, 7th and 19th. Mango Lanseria to Cape Town : Fridays are the most expensive days to travel on. Mango Cape Town to Lanseria : Where possible, travel in the middle of the week as it will be more cost-effective. Mango Johannesburg to Durban : Book your flights during the last week of the month to save on your travel plans. Mango Durban to Johannesburg : No blue Mondays here as that is the cheapest day of the week to travel on! Mango Johannesburg to George : Avoid travelling on the 18th where possible, as flights start from R2248. Mango George to Johannesburg : Aim to travel at the start of the month when flight prices are cheapest and try to avoid travelling on the 21st at all cost. Mango Cape Town to Durban : There is only one date to avoid travelling on. If you're planning on visiting a loved one, you might want to travel before the 12th. Mango Durban to Cape Town : Most days are relatively affordable this month, but stick to dates highlighted in green for big savings. Mango Cape Town to Bloemfontein : Where possible, don't travel on a Sunday as those are all very expensive. February is usually one of the hottest months of the year with temperatures soaring into the high 30’s and 40’s across the country. Luckily you’ll only have to suffer for four weeks, no more and no less as this is not a leap year. Best plan your escape to the coast before everyone else gets the same idea, especially if you want to take a loved one with. It is Valentine’s month after all! On that note you might want to avoid travelling on the 14th if you plan on escaping the hype or just want to save a few bucks. Take a look at our survey below to find which dates are the best travel on. Avoid travelling on the 6th and 27th. Rather plan your travels for the 4th and save a few bucks. Maybe you can even treat yourself this Valentine’s! The prices below were the cheapest we could find on the 3rd of November 2014 for each day in February 2015. Please remember that the more time that has passed since we set up this survey, the more likely it is that prices might have changed. For the most current airfares please visit Mango.co.za. Mango Johannesburg to Cape Town : Save when you fly on Sundays, just try to avoid Fridays. Mango Cape Town to Johannesburg :Prices are relatively consistent throughout, although Fridays are slightly cheaper. Mango Lanseria to Cape Town : Cost conscious travellers should try to book flights on Tuesdays and Wednesdays. 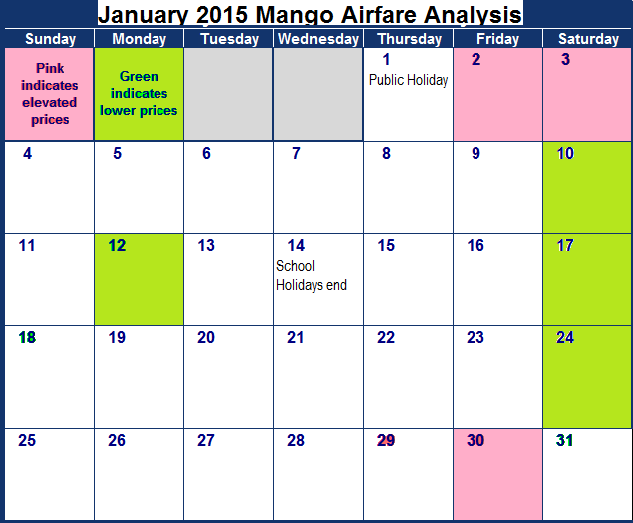 Mango Cape Town to Lanseria : Don't fly on dates marked highlighted in pink, generally Wednesdays are the cheapest. Mango Johannesburg to Durban : Avoid travelling on Fridays if you want to save. Mango Durban to Johannesburg : Prices are slightly elevated on Sundays and Fridays. Mango Johannesburg to George : Friday airfares are almost double that of flights on Mondays. 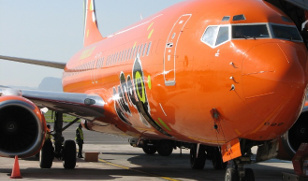 Mango George to Johannesburg : The cheapest day of the week to travel on is Wednesdays. Mango Cape Town to Durban : Dates highlighted in green are the cheapest to travel on. Mango Durban to Cape Town : Airfares are extremely consistent throughout the month of November. Mango Cape Town to Bloemfontein :The 5th and 19th are the cheapest dates to travel on. Mango Bloemfontein to Cape Town: Thursdays and Fridays are only slightly more expensive to travel on. Mango Cape Town to Port Elizabeth : Prices are the same on every single day this month. Mango Port Elizabeth to Cape Town : Avoid travelling on the 22nd, the most expensive day throughout the entire month.